1165LF-KS is rated 4.2 out of 5 by 22. 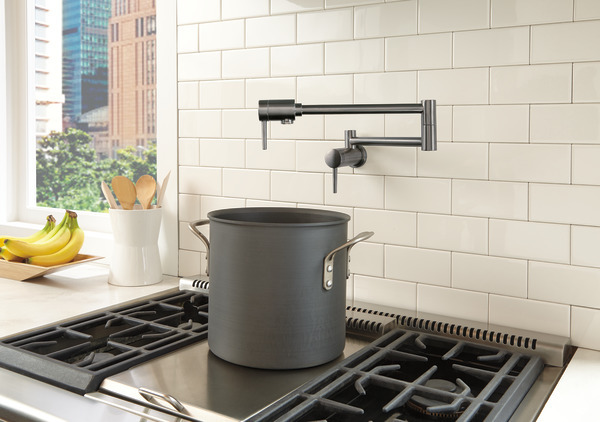 Filling pots on the stove has never been easier or more affordable, thanks to the new Delta Pot Filler faucet. 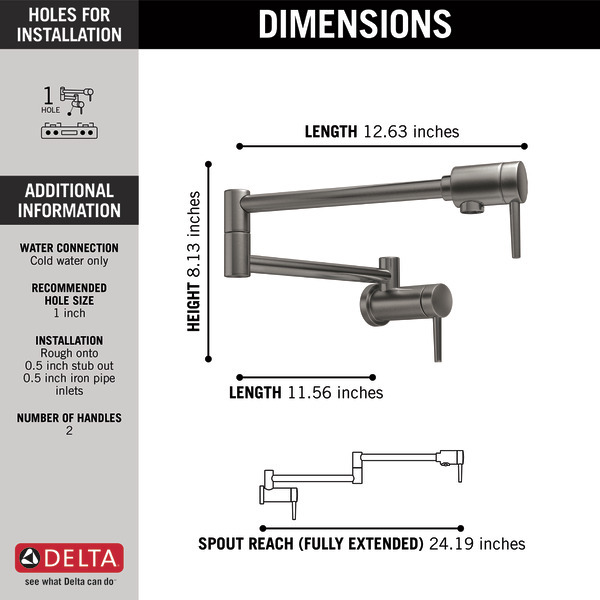 Very competitively priced, the ADA compliant Pot Filler features a wall-mount, dual swing joint design with dual shut off valves and a 4 gpm flow rate to fill large pots in no time. A pot filler makes it easy to fill large cooking vessels quickly and without the walk from sink to stove. Rated 1 out of 5 by DeltaUser from Shut off valve near wall does not close properly After a couple of month of rare use the shut off valve near wall stopped working by not tightly closing causing other end to drip if not closed. Rated 5 out of 5 by Liz from This looks amazing in my kitchen! Great item, very pleased with the pot filler. Rated 2 out of 5 by PaulD from shut off valve near wall does not close properly Installed this pot filler 2 months ago and was working great. Recently the shutoff valve near wall does not turn off water completely. 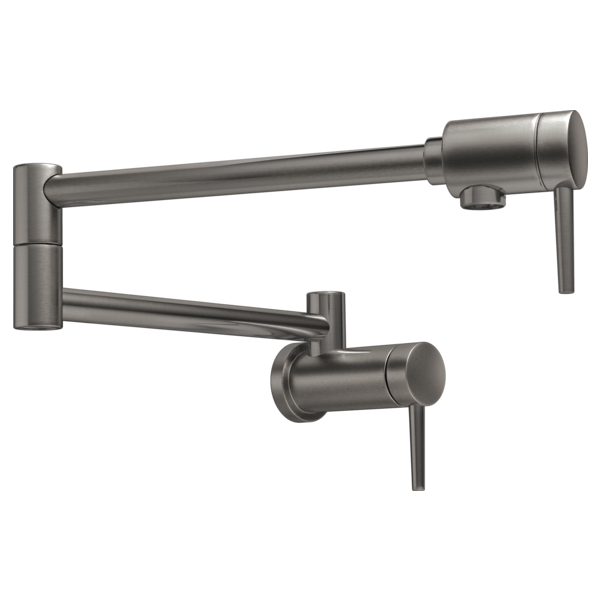 Rated 5 out of 5 by Rms from Great pot filler We got the matte black pot filler and love it. Rated 5 out of 5 by TT from Pot filler Pot filler. I chose this design because it’s contemporary styling and the matte black is contemporary too. It does not drip. I keep forgetting I don’t have to walk across the kitchen to be accessible to water. Rated 1 out of 5 by jkw from leak problem This pot filler leaks. The first one installed had a slow drip leak out of the faucet which we replaced under warranty and had a new one installed. It has a leak at the top of first safety against the wall. won't let me upload photo. Love the look, hate that i have a paper towel between it to catch leaks. Whats the difference between the stainless finish &amp; the arctic stainless finish on your pot filler? I currently have brushed nickel fixtures &amp; would like to get as close as possible to match the existing. Does this pot filler (1165LF-SS) require a valve body within the wall and, if so, what is the model number(s)? Need to install pot filler in a new house still under construction. Does this pot filler need a valve body within the wall similar to tub/shower valve bodies? If there is one, does it come with it or does it need to be ordered separately? Also, what is the model# of the valve body? Can I have a manual or instructions on how to leave the preparation in the wall? What is the material of the 1165lf-ss? I want to install this faucet so that when the faucet is folded up and against the wall it is the center of my wall. 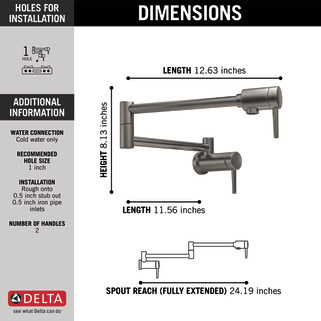 In order to do this I need to know the dimension from end to end when folded flat and the measurement showing the center of where the faucet connects to the wall from each end of the folded flat faucet. (example, the center of the connection to the left end is X inches and the center of the connection to the right end is Y inches). Then I will be able to determine where to make my 1&quot; rough in faucet supply. Thank you. Can you explain how the Pot Filler handles rotate? Clockwise? Counter-clockwise? When will this be available in Champagne Bronze?